One of my favorite books from childhood currently is on a bookshelf in my college dorm room. Titled simply Greek Myths, the book shows wear and tear, as well as a library cataloguing sticker that implies my dad definitely stole it from his college library (or perhaps, just neglected to turn it in). When I was young, I relished putting down the more complex books assigned in school and picking up this book of short stories filled with names I couldn’t pronounce and places I didn’t even know existed. There’s something about Greek and Roman culture that is fascinating to the average American, and not just their role in the founding and development of early democracy. Greek and Roman mythology includes a pantheon of gods and goddesses with all of the flaws and graces of humans. Sure, you’d be hard-pressed to find a true believer in Greco-Roman dogma in Richmond, but the stories are as well-known as Aesop’s fables and the characters as gruesomely fascinating as the contestants on The Bachelor or the Kardashian sisters. 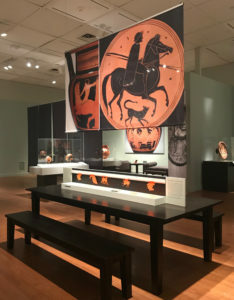 VMFA’s new exhibit, The Horse in Ancient Greek Art, capitalizes on this American fascination with what we know of Greco-Roman culture. The exhibit explores the role of the horse, yes, but that theme is far from limiting. Rather, the three rooms of the exhibit are full of tales of both equine and human bravery, companionship, and shenanigans. Effectively, each placard accompanying a vase or bridle tells a story straight from the pages of history. The exhibit is as much an exploration of public and oral history as it is of art. 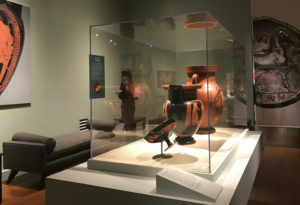 Arts stations in the middle of the gallery encourage visitors to explore black and red-figure vase techniques. I laughed out loud numerous times at the mischievous antics of young riders. I was wowed by the origin story of the Pegasus. I took a certain pride in the unique role of women in a number of the myths. While horse-fanatics may feel particularly at home, all mythology lovers will relish in the diversity of the stories told and connection of those stories to some rather breathtakingly ancient works of art. 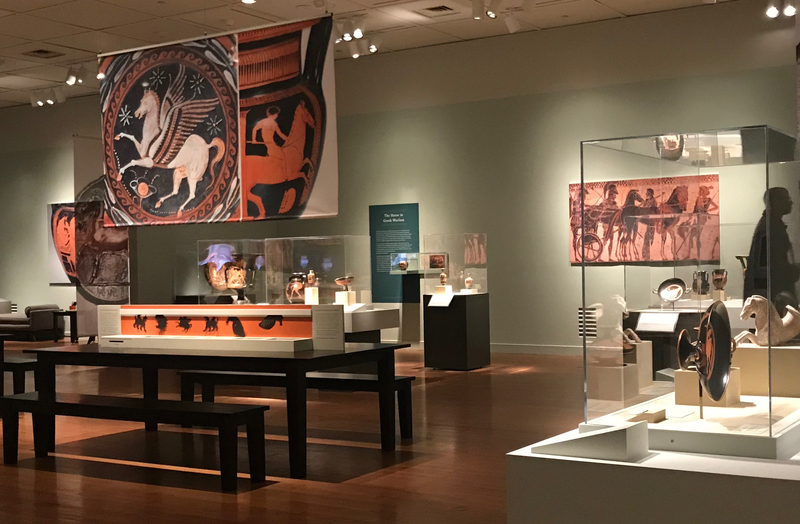 In-gallery activities help visitors of all ages connect with ancient Greek art and culture. Arts stations in the middle of the gallery encourage visitors to explore black and red-figure vase techniques. A lounge area (also inside the gallery) is modeled after a symposium of ancient Greece and includes poems by Virginia poet Ron Smith. Visitors can use notebooks to record their own poems, thoughts, and inspirations from the exhibition – just as ancient symposiasts were inspired by decorated vases. 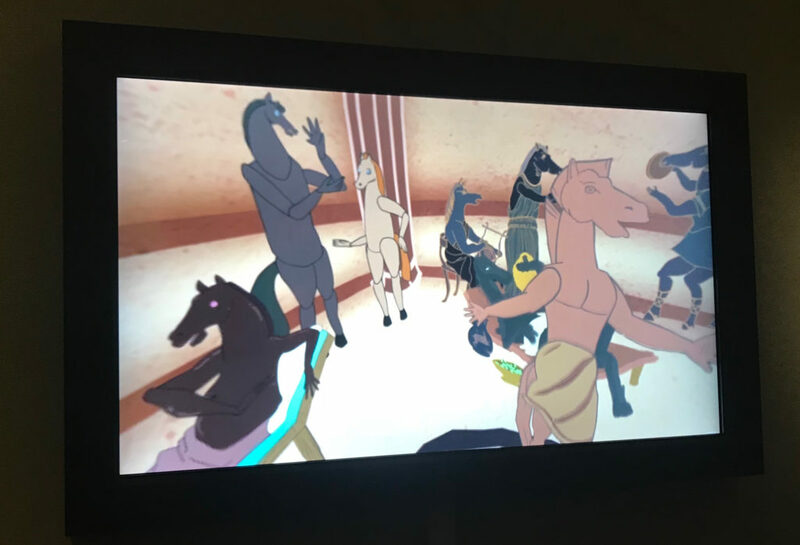 And this exhibit is multi-media: VCUarts students worked with VMFA staff to create animations exploring equine imagery in art and the function of decorated vases in Greek society. All the animations can be viewed on touch screens in the gallery or online. Full enjoyment of this exhibit does require that the visitor read and comprehend the text accompanying the artwork. For this reason, I recommend it for families with kids who are horse lovers and/or enthusiastic readers. The Horse in Ancient Greek Art runs through July 8 at VMFA and is a non-ticketed exhibit. For details, go here. VCUarts students worked with VMFA staff to create animations exploring equine imagery in art and the function of decorated vases in Greek society.